The RNSA-BC Squadron Summer Program for 2013. The RNSA-BC Squadron announce their plans underway for the summer season of 2013. The Squadron is looking forward to brilliant months of fine sailing and camaraderie in the beautiful waters of English Bay and the Straits of Georgia. The RNSA -BC Squadron Summer Program for 2013. To be held at HMCS Discovery,Vancouver British Columbia. 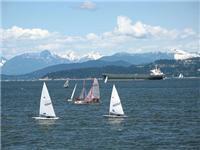 THE RNSA-BC SQUADRON 40th ANNIVERSARY SINGLE HANDED RACE. Vancouver to Snake Island, Naniamo and return to the Bell Buoy, Point Grey, Vancouver. JUNE 1st and 2nd, 2013. THE RNSA BC SQUADRON WIGWAM CRUISE. RNSA-SQUADRON 40th ANNIVERSARY CELEBRATION DINNER. RNSA BC SQUADRON ANNUAL AWARDS NIGHT. To be held in the Ward Room. HMCS Dicscovery, Vancouver British Columbia.